I'm a great fan of economical dishes that stretch a luxury ingredient between plenty of hungry people. 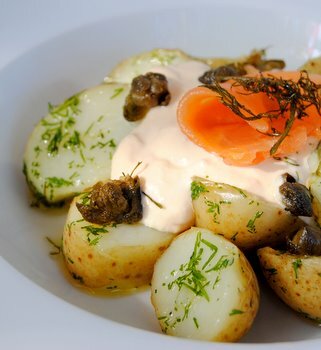 Here's a new recipe I think you'll love: top-quality smoked salmon (or, in this case, local smoked trout) whizzed into an unctuous home-made mayonnaise, poured over hot new potatoes tossed in fresh dill, lemon juice and olive oil, and then topped with frizzled dill and crunchy deep-fried caper 'flowers'. You've never seen a mayo of such a pale and delicate pink! I can't resist lovely earthy baby potatoes, boiled until just tender, and this is a new variation on one of my all-time favourite recipes, Hot Garlicky New Potatoes with a Cold & Silken Tuna Sauce. Please don't be put off by the idea of making your own mayonnaise. It's really easy to do, and once you get the hang of it you'll be making your own mayo once a week. (Here's some great advice about making mayonnaise.) I've given instructions for using a blender or food processor here. If you don't have such a gadget, you'll need to make the mayo by hand, and pulverise the salmon with a mortar and pestle. In this dish, I've used Franschhoek company Three Streams's superb cold-smoked trout (which I think is one of the very best ingredients the Cape has to offer) but you can use any local brand of really good smoked salmon. To my bafflement and disappointment, no one in my family really appreciates dill. I regard this as one of the Rolls Royces of herbs (along with thyme) and it maddens me that the ungrateful wretches turn their noses up at dishes containing more than a whisper of it. If you're faced with such philistines, used finely chopped fresh parsley or chervil instead. The Greek yoghurt is there to add a slight tang and lightness to the mayo, but you can leave it out if you like. I love the contrast of hot potatoes and chilled mayonnaise, so I suggest you make the mayo a few hours in advance. First make the mayonnaise. Put the egg yolks, salt and mustard powder into the (small) bowl or jug of a liquidiser, blender or food processor. (Or place them in a beaker, and use a stick blender.) Blend for a minute, until slightly frothy. Mix the vegetable oil and olive oil in a small jug with a pouring nozzle. Now slowly dribble the blended oils, in tiny increments to begin with, into the chute of the blender or food processor. Keep adding the oil, a little splash at a time, and within a few minutes you will see the egg mixture begin to thicken rather dramatically. At this point, add the oils in a slow and steady stream. When the mixture becomes so thick that the blades of the liquidiser refuse to turn, add the lemon juice and smoked salmon pieces, and just enough hot water (add it teaspoon by teaspoon) to blend everything together into a thick, smooth, silky sauce. Season generously with black pepper, and add more salt if necessary. Decant into a mixing bowl, stir in the yoghurt and place in the fridge until you need it. Put the new potatoes into a large pot, cover with cold water to which you have added the teaspoon of salt, and bring quickly to the boil. Turn down the heat slightly, and boil the potatoes briskly for 10-15 minutes, or until they are tender and cooked right through, but not falling apart. Now make the fried capers and dill. Using a piece of kitchen paper, pat the capers quite dry. Heat the oil in a small sauce pan until very hot, but not smoking. Drop the dried capers into the oil and fry for a minute or so, or until they open up like flowers, and become very crispy. Remove the capers from the pan with a slotted spoon, drain well on kitchen paper and reserve. Add the dill sprigs to the oil, two at a time (stand back, as they will spit and sputter with great drama as they hit the oil). Fry for 30-40 seconds, or until crisp. Drain on kitchen paper and reserve. Drain the new potatoes in a colander, and allow to cool for a five minutes. Cut them into thick slices, or halve them if they are very small. Place in a mixing bowl and add the olive oil and lemon juice. Season with salt and pepper. Scatter the chopped dill over the potatoes and very gently toss together until each slice is coated with oil and herbs. Strew the fried capers and crisped dill over the top. 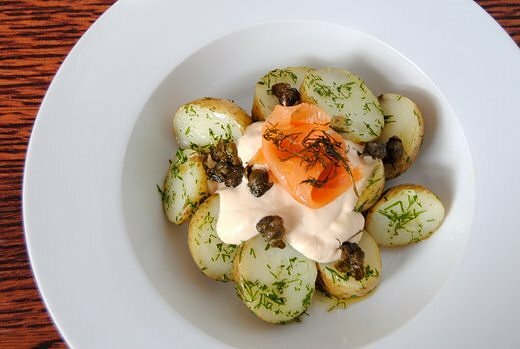 Arrange the warm potatoes in a heap on a big platter, arrange a few whole slices of salmon on top, and bring to the table with the bowl of chilled salmon mayonnaise. That mayo looks absolutely mouth watering. Such a creative way to incorporate the salmon!